I have had a passion for berry-picking probably since I realized there was a large patch of wild blueberries right across the street from where I lived when my oldest child was quite small. There was something about getting outdoors, sitting in the sunshine and finding delicious food, free for the picking. I still keep my eye open for berry patches, and enjoy discovering wild berries on my summer walks. But I’ve found it difficult to pick enough wild berries to satisfy my longing for summer fruit. Besides cultivating my own berry bushes in my tiny yard, the next best option I’ve found is U-pick berries. As we pick, there is the sense of discovery, “so many berries–wow!” and simply enjoying being outdoors with friends and family. This latest outing was with some of my grandchildren, and it’s now clear that my five-year old granddaughter is a devoted berry picker. The joy is being passed on to another generation! But I could tell we were not the only multi-generational group who had gathered in the early morning to pick berries. Cries of “Hey, Grandma, look over here!” echoed across the bushes. I started when I heard a child cry out, “Grandma,” and sometimes it was my own grands, but often it was other families enjoying the same experience. I have a special recipe I make only in the summer when we have an abundance of berries. 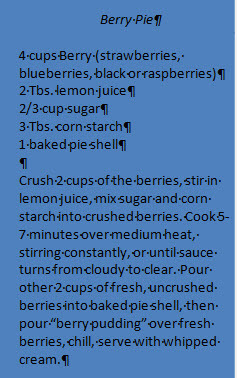 “Fresh berry pie” is a real treat at our house, perhaps because it isn’t something we have often. “Like” us on Facebook at “Easy Walks in Massachusetts” for updates about new trails and all things outdoors.